(Southwest Ranches, FL) – Broward Sheriff Fire Rescue’s Technical Rescue Team helps Brandy, a 22-year-old Appaloosa get back on her feet again Tuesday afternoon after her owner called for assistance. Leslie Kastner said that Brandy has a “blown out” right rear knee and sometimes has trouble getting up. The afternoon heat was also a concern and Kastner kept Brandy cool with water and cold towels while the rescue team responded to the 17400 block of SW 51 St. 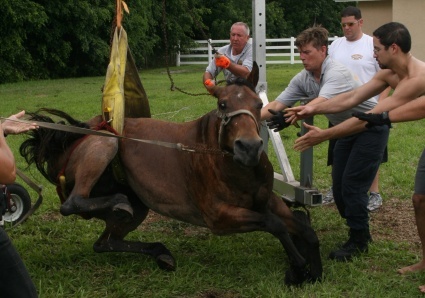 The team placed harnesses around the horse and utilized a lift to help Brandy get back on all fours. Kastner, also a Southwest Ranches Fire Lieutenant who specializes in large animal rescue and has trained with Broward Sheriff Fire Rescue in rescuing horses, cows, and llamas from unusual situations.